The Cité Internationale des Arts, Paris is a non-profit international art centre which provides studio accommodation for artists and scholars from around the world. The Art Gallery of NSW awards artists or scholars in the visual arts a two-month or three-month tenancy in either the Moya Dyring Studio or the Dr Denise Hickey Memorial Studio at the Cité. The Eva Breuer Travelling Art Scholarship will be awarded to one of the winners of these residency scholarships. Moya Dyring was an Australian artist and great supporter of young Australian painters and students visiting Paris. She lived at Quai d’Anjou on the Ile St Louis, almost opposite the Cité Internationale des Arts. After her death in 1967, her friends and family purchased a studio in her memory at the Cité for the continued support of visiting artists. Dr Denise Hickey was an art educator and former Trustee of the Art Gallery of NSW. This studio was named by the Gallery to honour Dr Hickey’s life-long dedication to the support and education of Australian artists. In memory of Eva Breuer, one of Australia’s most loved and prolific art dealers who made a signification contribution to Australian art in the 1980s and 90s, The Breuer Foundation has established an annual scholarship to be awarded to a young Australian female artist for the purpose of travel and study in Paris. The Eva Breuer Travelling Art Scholarship is an award of $25,000. The winner will be chosen from one of the winners of either a two-month tenancy at the Moya Dyring Memorial Studio or three-month tenancy at the Dr Denise Hickey Memorial Studio. Awarded to up to ten applicants a year. Covers the rent of the studio in Paris. Is without stipend and does not include fares to and from Paris. The successful applicant must pay a monthly maintenance fee to the Cité authorities, and must submit a two-page report detailing the outcomes of their study at the studio no later than one month after completion. Applicants must be a female artist, 35 years or under at the time of application. The winner will be chosen from successful applicants for the Studio Scholarship. The only one of these scholarships to come with a cash award. The award is valued at $25,000, payable in three monthly instalments for the two-month tenancy or four monthly instalments for the three-month tenancy. It must cover the costs of travel, monthly maintenance fee to the Cité authorities and living expenses associated with the residency scholarship. The successful applicant must be available to attend the winner’s announcement at the Art Gallery of NSW on Wednesday 16 October 2019. The scholarships are open to: established or emerging artists, or applicants pursuing research in the visual arts, including arts professionals, scholars and postgraduate students. Preference will be given to residents of Australia who have been so for at least two years. Complete the online application form by Sunday 12 May 2019, 5pm. Proposal outlining the project to be undertaken at the studio and demonstrate how the project will benefit by a stay in Paris. Proposals should be no more than 600 words and saved as PDF or DOC/DOCX files. CV outlining qualifications, relevant training, exhibition history, prizes and scholarships saved as PDF or DOC/DOCX files. PowerPoint of your work. Download the PowerPoint template and save your presentation in the following format ‘SURNAME_Firstname_2019’. Prepare a minimum of six to a maximum of twelve JPEG images of recent work formatted into a PowerPoint presentation. Format as a landscape presentation, with each slide featuring one image, centred on a white background with the caption underneath (title, date, medium and size). Make the first slide your name only. For multimedia works, applicants may include two additional videos (one video should be no more than two minutes). Videos must be a link to online content and URL saved on a new slide in the PowerPoint. Upload your PowerPoint onto a file sharing site and include the link in the application form. Finalists will be selected and contacted in late June. The Studio Scholarship is judged by Gallery staff. 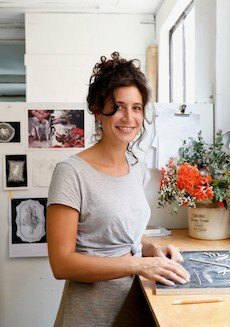 The Eva Breuer Travelling Art Scholarship will be chosen from one of the winners of the Studio Scholarship. One trustee from The Breuer Foundation will be part of the judging panel for this award.